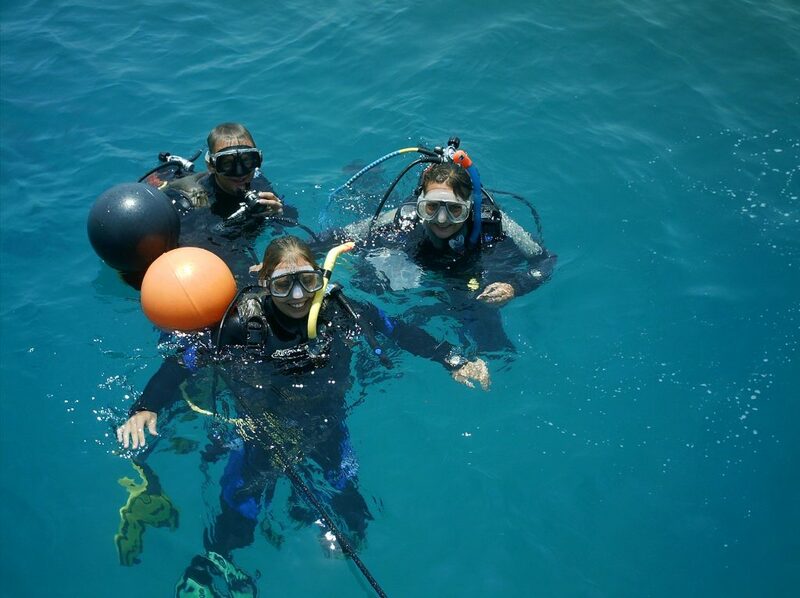 Learning to scuba dive during our Round the World trip back in 2006 is one of the best skills I have ever achieved. Before we arrived in Vietnam, I was a pretty naff swimmer and not really a fan of the water – especially not being under it. But, everybody who travels the world for a year learns to scuba dive (usually in Koh Tao, Thailand), don’t they? 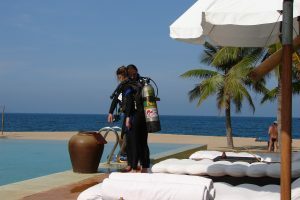 We hadn’t decided where I would do my scuba diving training before we set off on our RTW trip, but when we arrived in the beautiful costal resort city of Nha Trang in the south of Vietnam we fell in love, and so decided to stay a while so I could get my PADI licence. After wandering around checking out the various instructors, I decided to learn to dive with Sailing Club Divers. 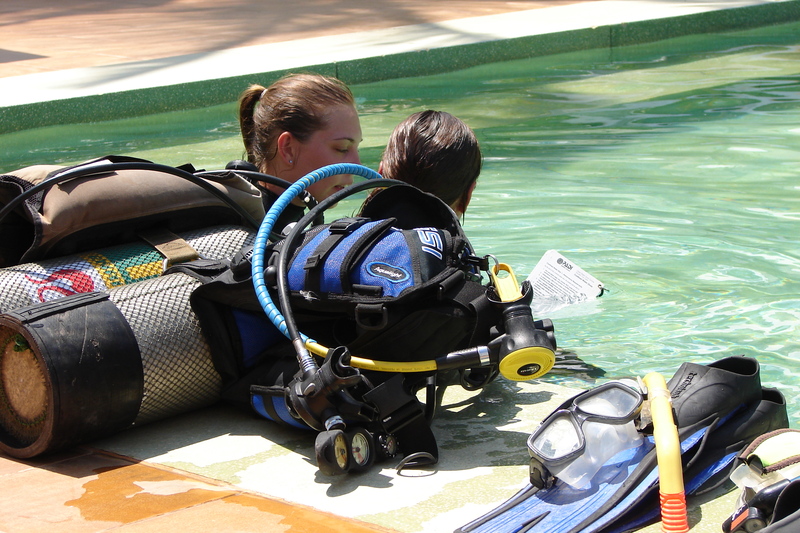 Darren was already qualified to dive, and I was the only person who signed up to the PADI open water course that week so I was super lucky to have 1-2-1 tuition with my amazing instructor, Leigh. After a couple of days of theory in my own private classroom, I was ready for my practical sessions. Back in 2006, Sailing Club Divers used the pool at the incredible Six Senses Evason Ana Mandara Hotel (I’m not sure they do any longer!) Never before had I been to such an incredible hotel! 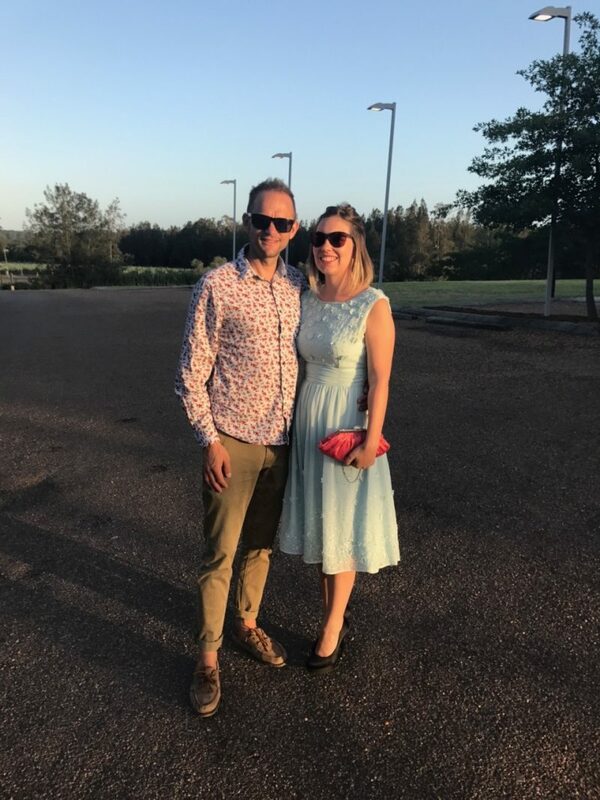 Situated on the beachfront , Darren spent the day relaxing on the sun loungers, being bought ice cold flannels and offered drinks we couldn’t really afford whilst I spent the day splashing around (literally) in the pool. 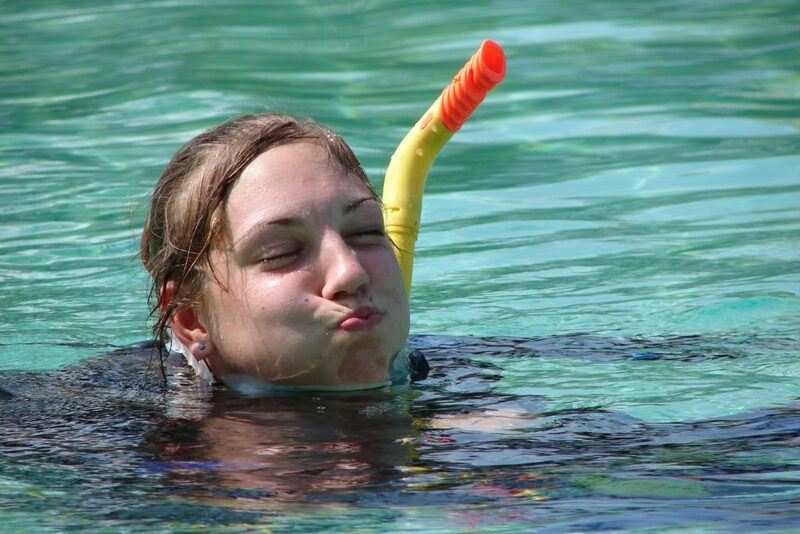 Before I could be taught how to dive, I had to prove I could swim…. Swimming however wasn’t (still isn’t) my strong point. I struggled to swim the 20m from one side of the pool to the other – it took what felt like forever. But I put my all in to it and finally made it to the the side. This photo makes me laugh every time I look at it. This is a face of determination! After proving I could ‘swim’ my diving lessons began. I shared the pool with one guest swimming lengths as Leigh taught me all I needed to know about going underwater with a tank full of oxygen. 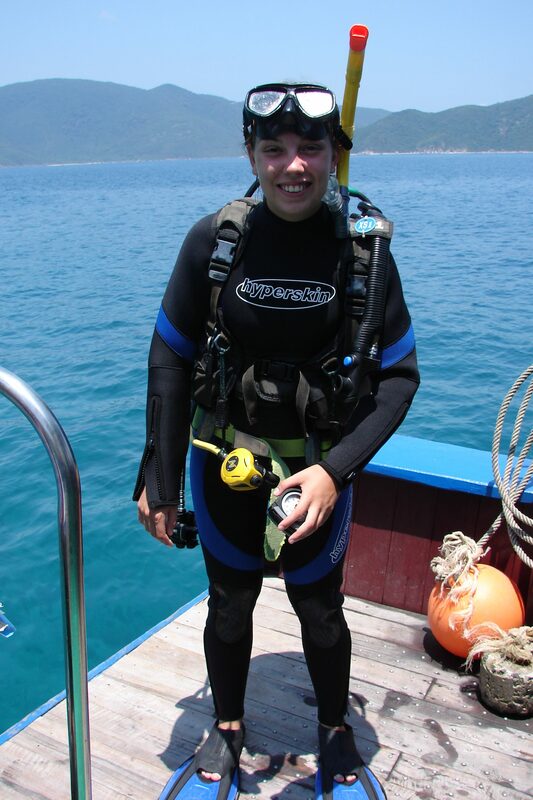 To get my Open Water Diver licence, I had to take 4 dives in the sea. The first dive went pretty well, but nearing the end my second dive, I had a panic attack. I desperately tried made my way to the top of the sea to get some air (not that my tank wasn’t providing me plenty). Having already been under the water for deep and long enough, Leigh held me down just below to make sure I didn’t surface to quickly. Obviously she was making sure I didn’t get poorly – but I could have killed the woman at the time for making me more frightened…. Obviously, my panicky dive didn’t count, so I had to do an extra dive to get my license which was no big drama – Leigh helped me overcome my fear of going (and staying) under and I remember really enjoying my final dive (which Darren tagged along with). It was really beautiful and peaceful under the South China Sea. I’ve never seen so many fish, or been in clearer water since! I was so proud of completing my PADI training. It was worth looking like a fool as I flapped my way along the swimming pool, the frightening panic attack and the horrible ear infection that I picked up along the way. Being able to scuba dive is an incredible experience, and I’m so pleased I was able to overcoming the fear of being underwater to do so. 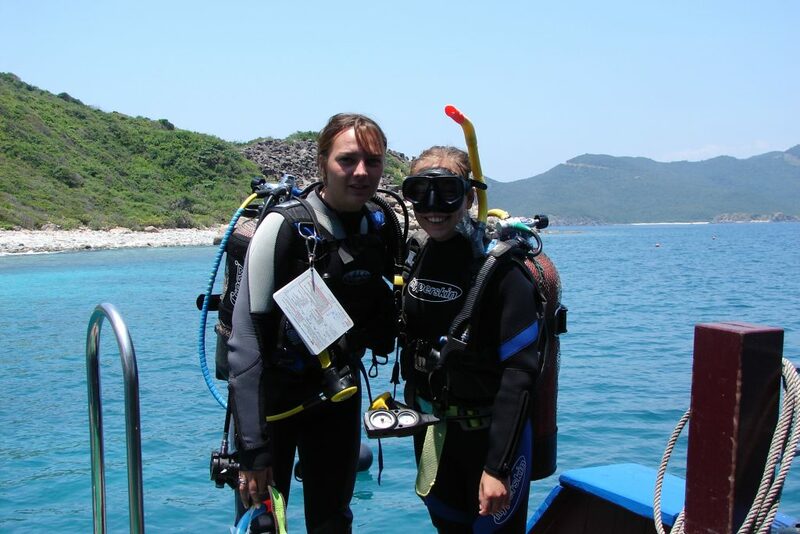 After learning to dive in Vietnam, we dived in both Koh Tao and on the Great Barrier Reef. Vietnam was our favourite of the three countries. It did lack in coral (as does the Barrier Reef) but it had the most incredible marine life. I’m not sure what its like now as Nha Trang is far more commercialised than when we visited, but diving in Nha Trang is a must. If you arrive in Vietnam without a PADI licence, I thoroughly recommend Sailing Club Divers. And the incredible Leigh. Although, I expect by now she’s long finished her stint as a dive instructor! Previous Post What a difference a week can make!